The first edition of Klankvorm will take place at V2_ on the 19th of May. This new series of nightly ventures promotes and initiates novel collaborations between sound and visual artists. The programme features exciting, radical and explorative audiovisual performances. At Klankvorm #1 we present three Dutch premieres consisting of analog, digital and laser projections accompanied by electronic sound structures. As a continuation of a recent audiovisual improvisation, Andrey Smirnov and Joost Rekveld started a new collaboration inspired by ‘Stigmergy’. This concept defines the stimulation of workers through the results they’ve accomplished. It relates to the chemical traces which regulate the activities of social insects such as ants, termites and bees, allowing for communication. Based on this principle Rekveld and Smirnov developed systems which generate images and sound which are used to create a new live composition. Saåad use layered field recordings to create deep drone and ambient compositions. Klara Ravat is an olfactory artist and experimental filmmaker creating dreamlike images, often accompanied by scent. In their performance the sounds by Saåad are combined with analogue 16mm projections by Ravat. ‘Refract / Recurse’ is an audiovisual performance by Tijs Ham and Birk Nygaard. 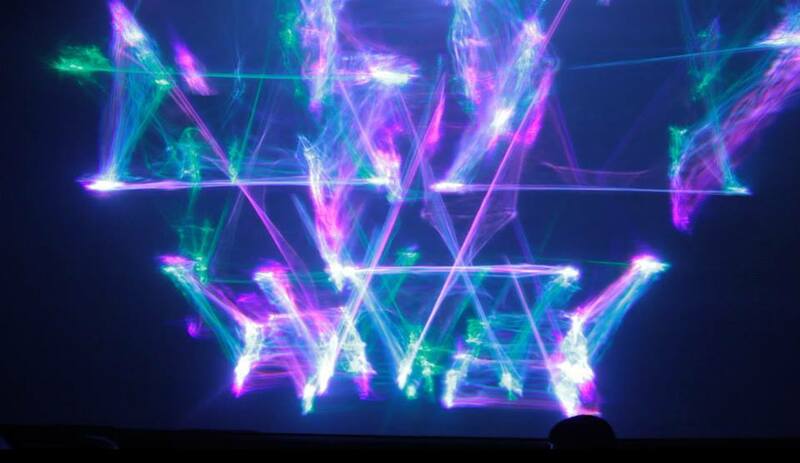 The project combines scattered laser projection and live electronics, consisting of feedbacking analog mixers. Together they generate musical landscapes and shimmering lights. The laser beams are refracted, lighting up the space in a hypnotizing pulse while the music slowly builds up to an all encompassing sonic wave.